Greetings, Pathfinder players! 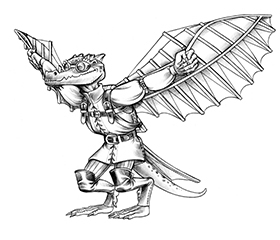 Advanced Races Compendium developer Steven T Helt here with a fun tease for you fans of the Midgard setting! Though the Compendium is setting neutral, many of you know that Midgard has offered a playable minotaur race for a long time now, so we’ve brought it to you as our very first stretch goal. The minotaur chapter was written by our own Karen McDonald and developed by yours truly. Inside you’ll find a detailed history for the minotaurs of Midgard, including elements portable to any home campaign. You’ll also find spells, feats, equipment, and magic items. Among the list of class options are archetypes and this fun oracle mystery: the mystery of the hunt! Class Skills: An oracle with the hunt mystery adds Knowledge (nature), Perception, Stealth, and Survival to her list of class skills. Bonus Spells: longstrider (2nd), acute senses (4th), locate weakness [UC] (6th), seeker’s arrow [DM] (8th), aspect of the wolf [APG] (10th), hunter’s shot [DM] (12th), transformation (14th), resonating word [UM] (16th), greater maze [DM] (18th). Revelations: An oracle with the hunt mystery can choose from any of the following revelations. A Good Kill (Ex): Whenever you kill a living creature, your instincts and senses sharpen. You gain a +2 morale bonus on Wisdom-based skills and checks for 1 hour. At 10th level, and every fifth level thereafter, this bonus increases by +1, to a maximum of +5 at 20th level. Dread Mark (Su): The fear you instill in your prey makes them increasingly vulnerable to you. You gain a +1 bonus to attack rolls and damage rolls against creatures who gained the shaken condition from one of your spells or abilities. This bonus increases to +2 if the subject is frightened, and +3 if the subject is panicked. Ferocious Stamina (Su): You gain the Endurance feat and a +1 bonus on Fortitude saves. At 8th level, and again at 12th level, this bonus increases by +1. I Hunt Alone (Ex): You are fully self-reliant in both combat and wilderness travel. You gain the Self-Sufficient feat. At 7th level, you gain a +1 dodge bonus to AC whenever more than one enemy creature threatens your space. The bonus applies only to attacks from creatures adjacent to you that you can see. At 15th level, this dodge bonus increases to +2. Loyal Companion (Ex) You gain an animal companion as the ranger class feature. Use your oracle level to determine your effective ranger level for this ability. You can choose this mystery an additional time to use your oracle level as your effective druid level for the same ability. Predator’s Lope (Ex): Your base speed increases by 10 feet. At 7th level, you are no longer affected by natural difficult terrain, though collapsed rubble or other unnatural formations do impede you. Oracles with the lame oracle curse cannot select this revelation. Preysense (Su): You can locate any creature you have dealt hit point damage to within the last 24 hours, as with the spell locate creature. At 11th level, you gain the lifesense universal monster rule (Pathfinder Bestiary 2) within 30 feet. You must be at least 7th level to choose this revelation. Spirit of the Hunt (Ex): Your divine connection to the hunt gives you supreme confidence. You add your Charisma modifier instead of your Wisdom modifier to Perception and Survival checks. You add your Charisma modifier instead of your Dexterity modifier to Stealth rolls. Tracking (Ex) You gain a bonus to Survival checks to follow tracks equal to half your oracle level. At 7th level, you no longer leave tracks through natural terrain unless you choose to. At 11th level, you can move your normal speed while tracking without taking a -5 penalty on your Survival checks. Who’s Hunting Whom (Su): At 11th level, you are the supreme predator, and even aggressive beasts sense it. When you confirm a critical hit with a melee or ranged weapon, your target must succeed at a Will save (DC 10 + 1/2 your oracle level + your Cha modifier) or become shaken for 1 minute. At 15th level, creatures who fail this save become frightened. Final Revelation: Upon reaching 20th level, you become a true lord of the hunt. You can move up to your speed and still take a full-attack action. You may move before the attack but not after. You automatically stabilize if reduced below 0 hit points, and you are immune to fatigue and exhaustion effects. 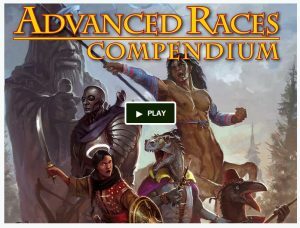 As of this writing, the Kickstarter for the Advanced Races Compendium has funded and the minotaur stretch goal has been hit! Please consider joining in if you haven’t, and if you have? Definitely watch for more stretch goals!